I can no longer stand to hear and read the ongoing “beating around the bush” in the public! You hear it constantly in the mainstream public and the alternative media how Merkel and her regime made a mistake, that she has done what she has done due to humanitarian reasons, being incompetent or other such nonsense. I am speaking about AfD Politicians and so-called International Law Professors like Dr. Albrecht Schachtschneider, as well as most of the authors of the so-called “Alternative News” spectrum. The flooding of our European Continent with non-White “migrants” from Africa and the Middle East, who are disguised as so-called “Refugees”, is not a MISTAKE, a “Humanitarian Act”, or a matter of “Incompetence”, but a precise, strategic political move of a globally organized and intricate occult network, which is implementing and achieving plans that are decades, if not centuries, old. No one can claim at this point that we are dealing with a conspiracy theory, because this occult network has disclosed itself and has become clear and visible through their own writings and statements. In other words, they have disclosed themselves by their own quill. 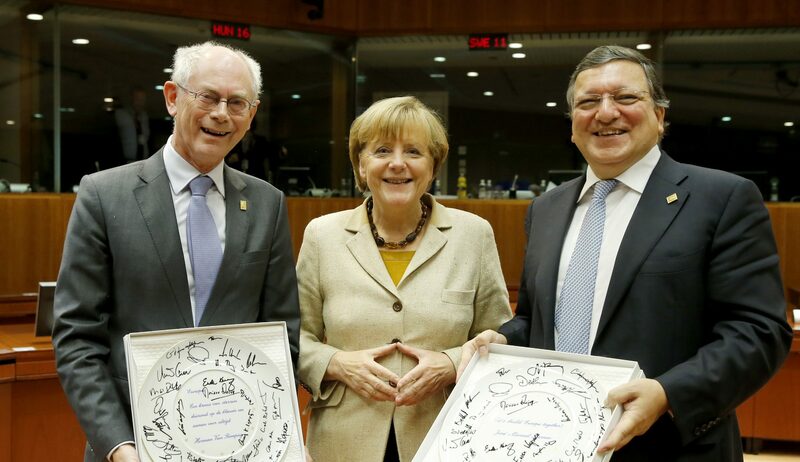 In 2010 German Chancellor Angela Dorothea “Merkel“ (Kasner/Kazmierczak) was awarded with the European Award by the European Society Coudenhove-Kalergi. Additionally she is a counselor of this foundation, just as former German Chancellor Helmut Kohl (Cohn), Jean-Claude Juncker (EU Commission President), and Herman Van Rompuy (President of the European Council) were. What is the goal of this occult society? Already in the year 1925 Richard Coudenhove-Kalergi defined the future for a new Europe in his book “Practical Idealism”. His plan: to create and establish a new race with new features and characteristics by mixing White Europeans, Asians and black Africans in order to change and alter the characteristics of the European people in “positive ways”. The new Europe shall be directed under the spiritual guidance of Judaism and the Jews who shall be Europe’s spiritual leadership. The Jewish Feudal-Nobility! Main representatives of this corrupt as well as upright brain-aristocracy: of Capitalism, Journalism and Literature, are the Jews. The superiority of their spirit predestines them to become a main factor in future nobility. A look at the history of the Jews explains their lead in the struggle for governance over humanity. The human of the far future will be a hybrid. Today’s races and castes will fall victim to the increasing overcoming of Space, Time and prejudgement. (In other words, it’s only a matter of time until individual races seize to exist). The Euro-Asian-Negroid hybrid race of the future, akin to the likeness of the ancient Egyptians, will replace the variety of races with variety of personalities. Richard Coudenhove-Kalergi and the Paneuropa-Movement was therefore established and is almost done being implemented with the European Union (EU). The quantity and colorfulness in the mainstream is in truth only a misrepresentation of the actual plan, which is the creation of atomized and reprogrammed human units. Additional leading powers within these occult politics are: Thomas P. M. Barnett, Barbara Lerner Spectre and former French President Nicolas Sarkozy. Thomas P. M. Barnett (b. 1962 in Chilton, Wisconsin) is an influential American Scientist in the area of military strategy. He therefore was able to present in March 2002 his first Geo-strategic results to former Secretary of Defense Defense Donald Rumsfeld. In his books The Pentagon’s New Map. War and Peace in the Twenty-first Century (G. P. Putnam’s Sons, 2004, ISBN 0399151753) and Blueprint for Action: A Future Worth Creating (G. P. Putnam’s Sons, 2005, ISBN 0399153128) Thomas P. M. Barnett declares that all who stand against Miscegenation and Multi-Culturalism are of immoral character and not in tune with current times. And that all who resist Globalization must be purged. So yes, I do account for non-rational actors in my worldview. And when they threaten violence against global order, I say: Kill them. Here we can see the reality of the Global expansion of the Kalergi Plan. Jews play a leading role in spreading Multi-Culturalism through Europe. Barbara Lerner Spectre, who leads a Government financed Jewish Study-group in Sweden, makes an interesting statement in this video. Her comment is an example of Jewish representation in past times: “To be a Light for Nations”. Jews are saving Europe by leading it into Multi-Culturalism. Barbara Lerner Spectre (b. 1942 in Madison, Wisconsin) is a American Jew, who is the founding director of Paideia – The European Institute for Jewish Studies in Sweden, a non-religious academic institute which was established in 2001. She received her PhD at the Bar-Ilan University in Ramat Gan, Israel. She got married to the Rabbi Philip Spectre and she and her husband moved to Ashkelon, Israel, in 1967, where she worked in the faculty of Jewish Studies at the Achva College of Education. After she moved to Jerusalem in 1982, she began to work at the faculty of the Shalom Hartman Institute in Jerusalem, the Melton Center of the Hebrew University as well as the Yellin College of Education. She was founding chairman of the Schechter Institute in Jerusalem in 1984. In 1999 she immigrated with her family to Sweden and took up residence in Stockholm, where her husband became Rabbi of the Stockholm Synagogue. In 2000 she was contracted by the Swedish Government to write the founding statutes for her Jewish Study Group, entitled “Paideia”, and her group was named after it. Paideia – The European Institute for Jewish Studies in Sweden. She continues to lead this group to this day. Up until 2011, Paideia trained over 200 people from 35 countries for management positions for the renewal of Jewish Culture in Europe. What is the goal? The goal is Miscegenation (race-mixing)! And if people are not willing to do this on their own free will, then we shall force them through governmental measures. The Challenge of Miscegenation of the various nations is the Challenge of the 21st Century. It is not a choice, it is a duty. It is mandatory. This Jewish Feudal-Nobility in Europe and the world, which is an obvious and well-aimed undertaking, can also be seen in important and obvious UN and EU planning documents. The population of almost all European countries will shrink without immigration. In order to retain the proper amount of work-capable people of age in relation to the population, Germany needs 6000 Immigrants per 1 million inhabitants yearly [= 480.000 consistent with analysis]. The term “Replacement migration” correlates to immigration from a foreign country to another country, in order to prevent a population from shrinking and dying out due to low birth rates and due to mortality rates. However, in order to achieve this goal, the number of immigrants for all of Europe would have to be doubled. Improvement of the legal Migration-channels: Commission proposes a new EU-Settlement Agreement. The European Commission proposes today a new EU-Settlement Agreement. With this a Common European New Settlement policy shall be established, which will assure people who are in need of international protection to be able to seek safe passage and refuge into Europe. This proposition is part of the Commission’s planned reform of the Common European Asylum System and the European Migration-agenda’s outlined long-term strategy for improved migration management. As you can see, this is not about humanitarian efforts to help so-called “refugees”, “sanctuary seekers”, or “asylum-seekers”. It’s all about a well aimed settlement of Non-White races into Europe and North America in order to enforce Miscegenation. Do not declare the author of this text now as a “racist”: It is their own words! It’s about the creation of a new human – a hybrid – a population who is incapable of critical thinking. A people smart enough to work, but dumb enough to be tolerated. (A hybridized race of people who are nothing more then automatons – a slave race). Please stop beating around the bush and start spreading the truth to as many people as you can. Even a half truth is a lie. Those who lie to themselves, despite these obvious facts, spread a half truth.